The LUX (Large Underground Xenon) experiment has just announced results from their first run, which gathered data for 85 days between April and August of this year. LUX is located a mile underground (to shield from cosmic rays and other interference) in an old mine in South Dakota, and employs a liquid Xenon detector with total mass of 370 kg. LUX is searching for WIMP dark matter particles which recoil directly off the nucleus of Xenon atoms in the detector. They have two important findings from this first swath of data. First, to within the sensitivity of their experiment, they detected no weakly interacting massive dark particles (WIMPs). And second, their experiment has much greater sensitivity than other experiments in the low mass range from about 5 GeV to 100 GeV (the proton rest mass is a bit less than 1 GeV). Thus it is placing much tighter constrains on the cross-section for dark matter to interact with a nucleus, and the density of dark matter at the Earth’s orbit. 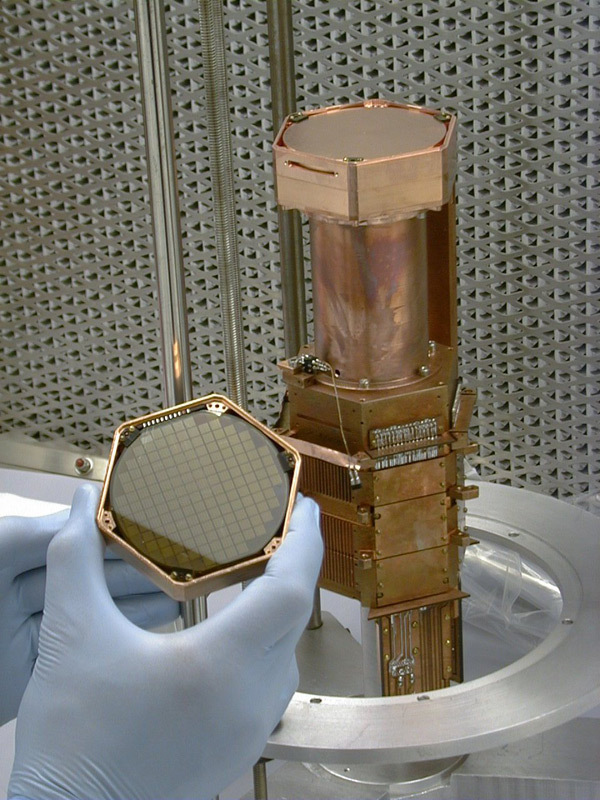 The previous largest Xenon-based experiment was XENON100 (for 100 kg total detector mass). With LUX, the sensitivity has improved over the results of that earlier experiment by around a factor of 20 for a possible 10 GeV WIMP mass, due to the larger target and better rejection of background events. This chart is the most interesting portion of Fig. 5 from the LUX first results paper (reference below). The blue line shows the upper limit on the cross section dropping from 10^-40 cm² to less than 10-44 cm² as a function of WIMP mass, as the mass increases from about 5 to 12 GeV (X-axis above the chart). Note the Y-axis is logarithmic, so the new limit is orders of magnitude below other limits (various colored curves) and claimed possible detections (shaded areas). These new LUX results are in direct conflict with possible detections from CoGeNT (small red-shaded area on chart), CRESST (yellow-shaded), CDMS- II (green-shaded area), and DAMA/LIBRA (grey-shaded area), all of which were suggesting detections with a WIMP dark matter mass around 10 GeV. Now certain assumptions are made about the astrophysical parameters such as the density of dark matter at the Earth being the same as the average in our part of the galaxy. But other experimental results are based on similar assumptions, so this does not explain the discrepancy. Both CoGeNT and CDMS-II sit in the same Soudan Laboratory in Minnesota, one state over from where the LUX experiment resides. However different experiments use different atoms as targets: CoGeNT uses germanium, CDMS uses silicon, CRESST uses calcium tungstate crystals and DAMA/LIBRA uses thallium doped sodium iodide. These latter two experiments are both located in Italy, in a mountain tunnel. All of these experiments are attempting to discern a very faint signal against significant backgrounds. And perhaps earn a Nobel Prize in Physics as well. So it’s natural for the researchers on the associated teams to lean toward optimism It remains quite possible, and now seems more and more probable, that the experiments other than LUX are observing some unexplained non-dark matter background effect, so this is a very significant result. LUX is not finished, of course. It’s just getting going. So we await their further results, with either a possible WIMP detection in the future, or even tighter limits on the existence of lower mass WIMPs. The discovery of the Higgs boson at the Large Hadron Collider (the LHC, at CERN, near Geneva) was announced on the 4th of July, 2012. This new particle was the important missing component of the Standard Model of particle physics; the Standard Model has had great success in describing the three non-gravitational forces: electromagnetism, the weak nuclear force, and the strong nuclear force. The mass of the Higgs is about 126 GeV (giga electron-Volts) and by way of comparison the proton mass is a bit under 1 GeV. The Higgs particle is highly unstable, with a decay lifetime of only about one tenth of one billionth of one trillionth of a second (10^-22 seconds). While the Higgs field pervades all of space, the particle requires very high energy conditions to “pop out” of the field for a very short while. The only place where these conditions exist on Earth is at the LHC. The Higgs boson is not detected directly at LHC, but inferred (with high confidence) through the detection of its decay products. The main decay channels are shown in the pie chart below, and include bottom quarks, W vector bosons (which mediate the weak force), gluons (which mediate the strong force holding quarks inside protons and neutrons), tau leptons (very heavy members of the electron family), Z vector bosons (also weak force mediators), and even some photon decay channels. While the two photon channel is rare, much less than 1% of the decays, it is the most important channel used for the Higgs detection because of the “clean” signal provided. What is the relationship between the Higgs and dark matter? In an earlier blog, http://wp.me/p1mZmr-3K , I discussed why the Higgs particle itself cannot be the explanation for dark matter. Dark matter must be stable; it must persist over the nearly 14 billion year lifetime of the universe. In today’s universe it’s very difficult and expensive to create a Higgs particle and it vanishes immediately. But in the very early universe, at a tiny fraction of a second after its creation (less than the present-day Higgs boson lifetime! ), the “temperature” and energy levels were so high that the Higgs particle (or more than one type of Higgs particle) would have been abundant, and as today it would have decayed to many other, lighter, particles. Could it be the source of dark matter? It’s quite plausible, if dark matter is due to WIMPs – an undiscovered, stable, weakly interacting massive particle. That dark matter is due to some type of WIMP is currently a favored explanation among physicists and cosmologists. WIMPs are expected from extensions to the Standard Model, especially supersymmetry models. One possible decay channel would be for the Higgs boson to decay to two dark matter WIMPs. In such a decay to two particles (a WIMP of some sort and its anti-particle), each would have to have a rest mass energy equivalent of less than half of the 126 GeV Higgs boson mass; that is, the dark matter particle mass would have to be 63 GeV or less. There may be more than one type of Higgs boson, and another Higgs family particle could be the main source of decays to dark matter. In supersymmetric extensions to the Standard Model, there is more than one Higgs boson expected to exist. In fact the simplest supersymmetric model has 5 Higgs particles! Interestingly, there are 3 experiments which are claiming statistically significant detections of dark matter, these are DAMA/LIBRA, COGENT, and CDMS-II. And they are all suggesting a dark matter particle mass in the neighborhood of just 10 GeV. 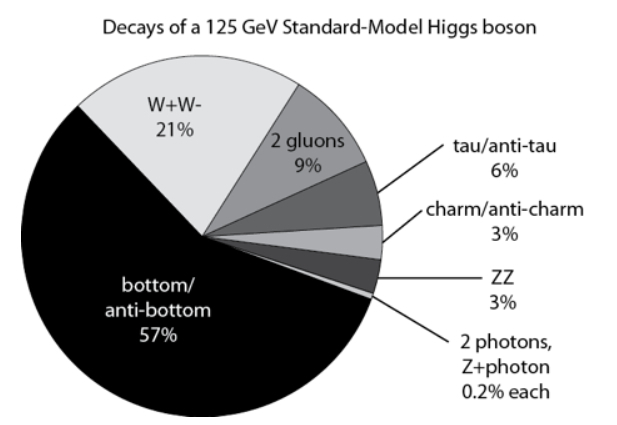 Heavy, compared to a proton, but quite acceptable in mass to be decay products from the Higgs in the early universe. It’s not a problem that such a mass might be much less than 63 GeV as the energy in the decay could also be carried off by additional particles, or as kinetic energy (momentum) of the dark matter decay products. At the LHC the search is underway for dark matter as a result of Higgs boson decays, but none has been found. 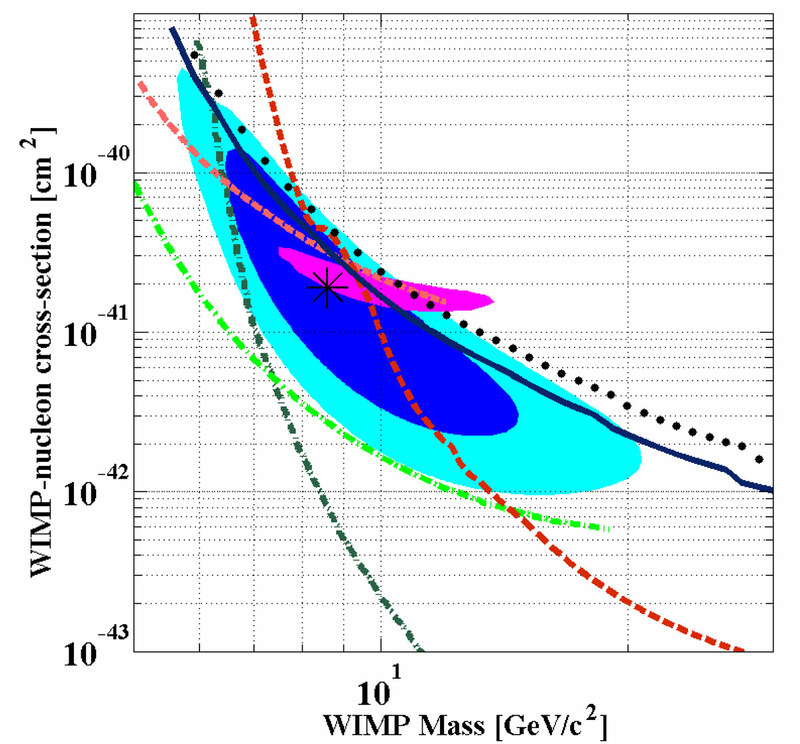 The limits on the cross-section for production of dark matter from Higgs decay do not conflict with the possible direct detection experiments mentioned above. The search for dark matter at the LHC will actively continue in 2015, after the collision energy for the accelerator is upgraded from 8 TeV to 14 TeV (trillion electron-Volts). The hope is that the chances of detecting dark matter will increase as well. 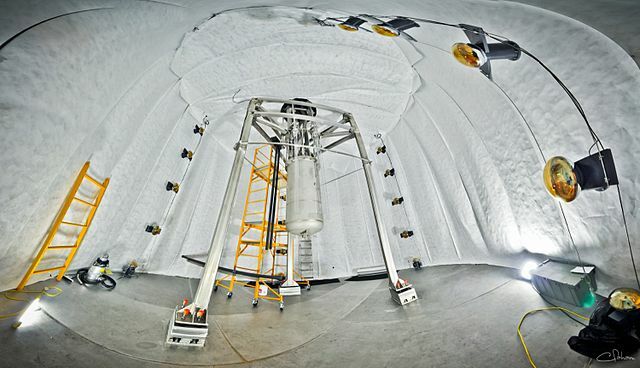 It’s a very difficult search because dark matter would not interact with the detectors directly. Rather its presence must be inferred from extra energy and momentum not accounted for by known particles seen in the LHC’s detectors.